Most of you have probably already seen/heard about this and if you haven’t…actually, I can not think of any reason why you haven’t. I mean a MAN jumped from a stratospheric balloon to make a FREE FALL to earth from 120,000 FEET at SUPERSONIC SPEED, FASTER THAN THE SPEED OF SOUND before PARACHUTING to the ground. C’MON SON. C’MON. And to top it off, he has one of the coolest names going, FELIX BAUMGARTNER. C’MON. 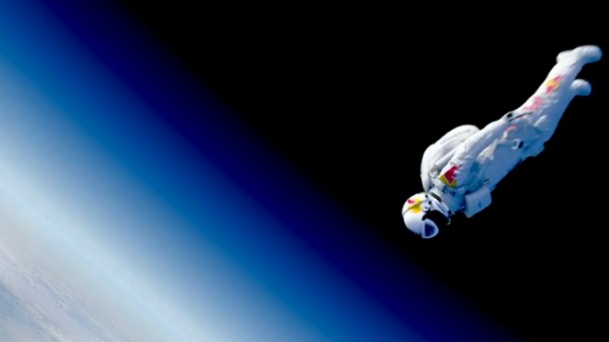 Ok, now that I’ve officially and un-ashamdely geeked out :-), I would also like to high-light the science behind this Red Bull Stratos mission/collaboration and the valuable medical and scientific research data now available for future pioneers/researchers. The data produced during the test runs has proven to be invaluable to the future development off aerospace engineering, aerospace medicine, engineering, pressure suit development, capsule creation, balloon fabrication and technology to name but a few. So if you are one of those people who is wondering what all the fuss is about, I hope the above puts you at ease. Remember without so called “crazy” efforts like this, by people who take risks to find out something new, we probably would not be able to get to the other side of the earth in a plane for our holidays let alone space. All the above is brilliant but what is also amazing is that we got to WATCH IT ALL LIVE. Can you just imagine the young kid who wants to be a astronaut and his/her excitement? Not only did we get to watch it live, FELIX TWEETED WHILE IN SPACE! I mean, C’MON SON. I also want to say that Red Bull did a fantastic job with the website, not only was it informative and easy to use but it also made the science easy to understand. Click on the link and learn more about this event than just the hype. Furthermore, the fact that Joe Kittinger, the man who made history before Felix was a member of Felix’s team and the voice of “reason” during his jump, ultimately helping him beat his own record was inspiring. Remember, Joe did it when no-one knew if you could even survive such a jump. He ascended to 102,800 feet in a high-altitude balloon and jumped to Earth, setting four world records in 1960. Play the video below to learn more about Joe Kittinger, he deserves it. If you have not already seen the advert before the jump you must. I love it. And finally, here is Felix’s Jump. Click play and watch history being made. haaa haaa haaa, you win indeed Felix, you win. Congratulations. Until next time, stay blessed all.